There is no getting away from the fact that the Italians come into this game in better shape than their German opponents. The hosts are currently 1-3 in the Euroleague while Milan have a 2-2 record at this point. Both teams may be low on confidence heading into this game but they’ll both believe they can grab a win on Thursday night. The Germans have lost three games this season but the first two games were lost by a single point each and then the third loss was by 4 points. This suggests that Brose Baskets aren’t too far away from getting results. There is no doubt that they have been under-par so far in the Euroleague but they’ve won at home already this season and they’ll see no reason why they cannot grab a second win in Germany this campaign. Darius Miller leads the way with 13 points per game while Janis Strelnieks has provided an average of 12 points per game for the hosts. While Milan’s 2-2 record is better than the one held by their hosts, they have lost their last two games. A strong start to the season raised hopes that Milan would have a better season than they have had in recent years but it looks as though there is going to be another year of ups and downs for the Italians to endure. 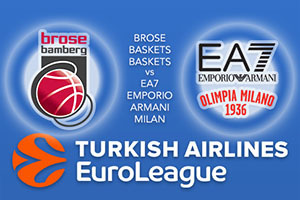 However, Milan haven’t lose to Brose Baskets at any point in the Euroleague with the Italians being 4-0 up. If they get big performances from players like Ricky Hickman, with an average of 12.8 points per game and Milan Macvan, on an average of 12.8 points per game, they’ll have a decent chance of returning home with a win. This has the hallmarks of a tight game but the bookmakers think the hosts will just about edge it. There’s a lot to be said for the German side taking control so back Brose Baskets at -3, which is available at odds of 1.90. Anyone looking for the Over/Under market will find that going UNDER 162.0 at 1.90 is a decent bet. Bet Now!